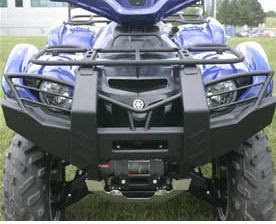 The all new Front Brush Guard for the Grizzly 700 enhances the front end of this 4 wheeler. Designed by Yamaha to give you an aggressive, tough and handsome look. With this extreme profile you will get noticed! This high quality accessory is precision cut and formed from cold rolled steel for maximum durability. The brush guard is etched and powdercoated using a non-toxic environmentally friendly process which results in superior paint adhesion and durability.